Physically writing down your list of concerns and questions for the doctor regarding your loved one is going to save your sanity! The stress of forgetting to bring something up at the appointment can plague caregivers, and when your loved one is medically complex, it’s easy to forget, for example, that you had a question about higher than normal heart rate when you’re busy discussing recurring pneumonia and seizure frequency. I recommend maintaining a list at home regularly as concerns and questions come up, or taking some time the night before your loved one’s appointment to sit and focus and compose a list accordingly. Not only does having a list make sure you check off all the boxes in the appointment which you wanted to, but it actually helps your loved one’s doctor. They can see you reading off a list that you have thoughtfully prepared, it structures the dialogue you are having, and they may even ask to see it and make a copy for their own records. Sometimes doctor’s offices ask that you physically bring in all the medicine you are taking, especially at new patient appointments. Your medicine list can often serve in place of this hassle, however, you might want to check with the doctor’s office prior to your arrival. In addition to the medicine list and questions/concerns, don’t forget to write down and bring recent vitals readings and updates regarding your loved one’s day to day wellbeing, symptoms, and so forth. If you track daily blood pressure readings, bring that notebook (or virtual smartphone name), especially if there is concern about anomalies. Same goes for daily blood sugar readings, oxygen saturation levels, temperatures, etc. Recent medical history might include any treatments your loved one recently received from other providers (i.e. we have to remember to tell Mom’s neurologist when her GP has just treated her for pneumonia or a UTI), as well as any incidents or symptoms like seizures, confused outbursts, tremor episodes, etc. Every detail can play an important role in helping your loved one’s doctor paint a full picture of their health and potential problems that need to be addressed. As any patient knows, you can show up for an appointment and end up waiting an hour to actually see your doctor. 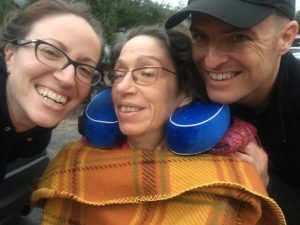 Being stuck at the doctor’s office when they are running behind and you have no food or water can be a tough situation for you and especially your loved one. We’ve even spent hours in the E.R. at a hospital and they were unable to offer snacks and drinks when Mom was starving. We recommend packing quick, easy snacks and appropriate drinks in the bag you bring along to your loved one’s appointment. If your loved one has dysphagia, make sure to pack plenty of thickened fluids for them to sip on while you wait at the doctor’s office to prevent dehydration. Healthy snacks will also make sure your own blood sugar and energy levels don’t plummet (which can turn your loved one’s appointment into a hangry one) – I like to have granola bars or fruit and nut packs on hand. 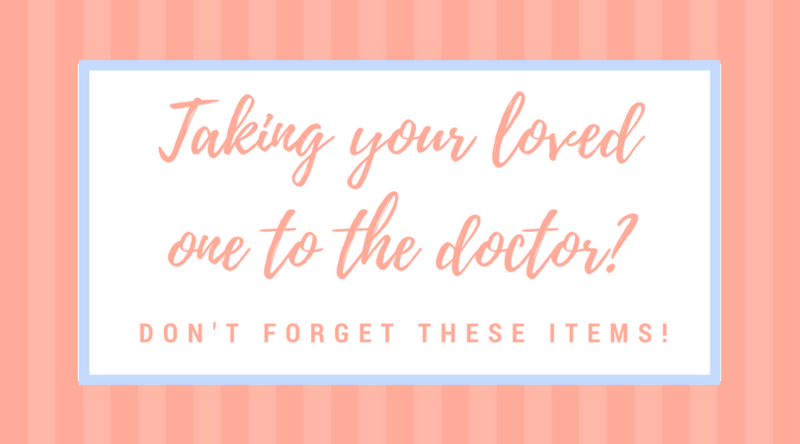 In the case of Mom (and like many patients with chronic illness or seniors with mobility issues), we also have to remember extra briefs, wipes, underpads, and a change of clothes in case we have a mess on our hands in the bathroom while at the doctor’s office. Sometimes a doctor might give you quick orders for lab tests and direct you to go to another office to have an x-ray done or blood drawn, for example. Being extra prepared with food, change of clothes, water, and emergency medicine will help you feel less stressed and equip you for worst case scenarios.